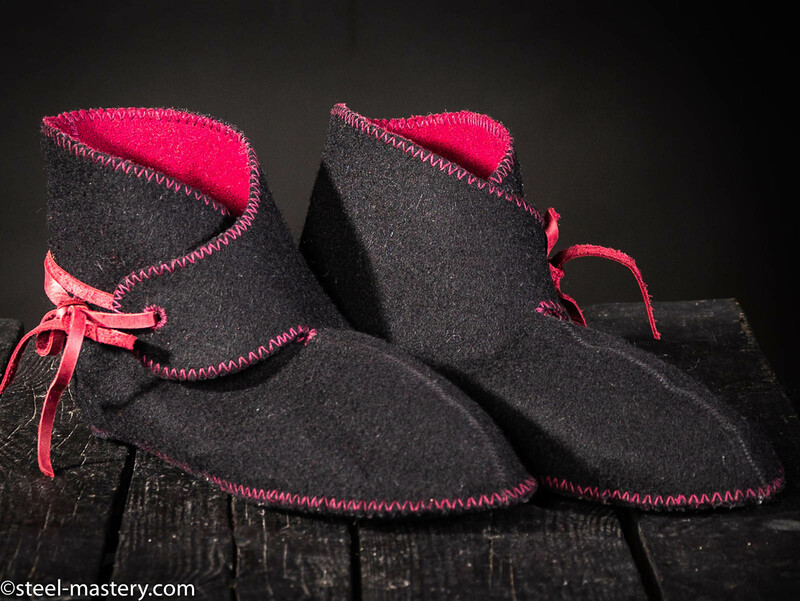 thick wool, lined with soft flax, with linen lining. historical one and offered for additional costs. any colors of wool and linen for your shoes. Among our customers, dark brown and grey colors are the most popular. However, even such colors as pink or sky-blue are available for order.  Leather color you could chose too. Also as an option they may had a leather sole. - Convenient payment systems (PayPal, Skrill, Visa, MasterCard, American Express). 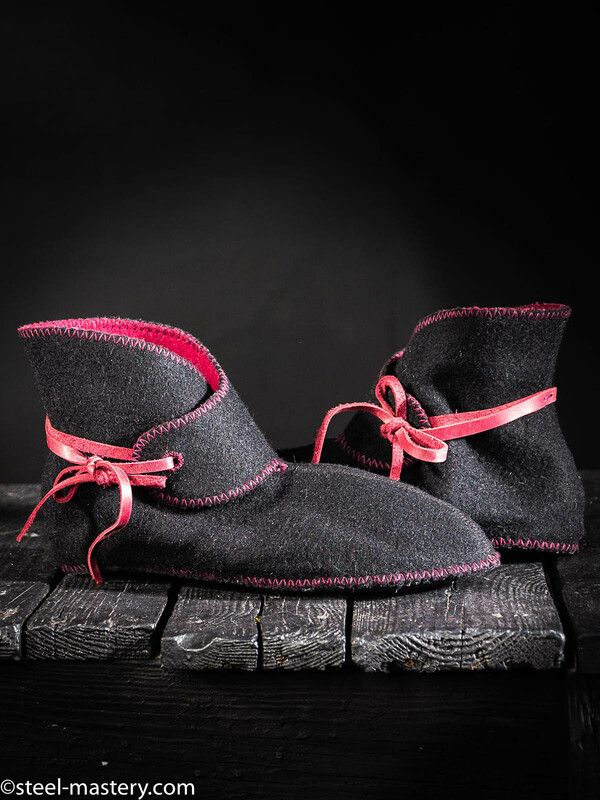 Check out these models of home medieval boots: wool shoes for home, medieval style wool shoes. wish, please send us photo and description of the required model and we will make it for you. Leather sole for best protection esthetic. Long dress has a cut with lacing on the neckline, and contrast laces on the sleeves. All holes for the lacing are handmade. A great addition to this dress is coat with short sleeves. Different colours of 100% natural fabrics are available for order. The belt is not included to the price. ..
Belt with fittings from Goltland, 10c. width 20 mm .. Medieval bronze buckle of the 1350-1480 years is a reconstruction of accessories of the Western Europe of those times. Men's and women's medieval costumes of the XIV-XV centuries are notable for bright colors. Clothing of that period allowed different additions. So-called Burgundian fashion, fine and picturesque, becomes trendy. Accessories were complementing look and pointing wealth of wearer. Buckle was not only fixing belt, but was also a bright part of outfit. Pinked frame is original and suitable for women’s and men’s garb. Material: bronze. Buckle size: 37 x 39 mm Strap width: 23-31 mm. .. Medieval buckle “Acorns” is made of high-quality bronze. This buckle is reconstruction of models, which are pictured on the paintings of the Flemish artists in the XIV-XVI centuries. Buckle conforms fashion trends and tastes of the late Middle Ages. As not a single outfit got along without such an accessory as belt. Social status of a man could be inferred by belt and buckle. Frame of buckle is trapezium-shaped. Prong for belt fixation resembles crossbow or bottom of ballista. Decorative acorns are placed on two corners. Handcrafted buckle is firm and good-quality. This buckle goes well together with black or brown belt. Material: bronze. Buckle size: 35 x 50 mm. Strap width: 20-25 mm. ..